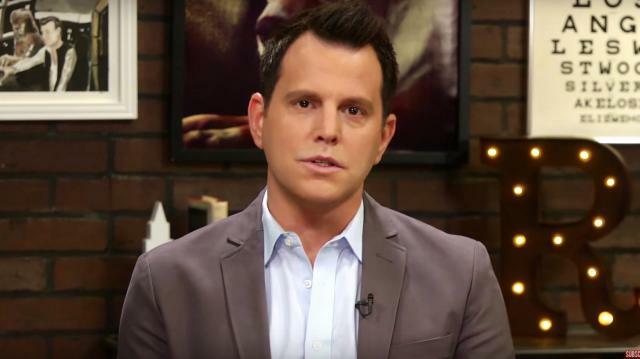 Dave Rubin discusses the recent Paris attacks by ISIS where 129 people were killed. "The more we ignore the very set of ideas these people tell us that they're are using to attack us, the more we actually strengthen them." Of course I have to start this week by talking about the horrific Paris attacks. Sadly, it seems these attacks are becoming all too common these day, and each event continues in the path of carnage and absolute barbaric savagery these Islamic extremists want to impose on the western world. Yes, I did say Islamic extremists there. I know that upsets some people and makes the politically correct crowd uncomfortable. Unfortunately, the more we ignore the very set of ideas these people tell us they are using to attack us, the more we strengthen them. This is what my former guest Maajid Nawaz told me he refers to as the "Voldemort Effect." JK Rowling described this idea in the Harry Potter books as "Fear of a name only increases fear of a thing itself." Are there any other ideas that we should be afraid of talking about? I can't think of any, and I refuse to treat this one differently. We can't be afraid of "scary" things, especially in idea form, because that's how they will grow and morph right in front of our eyes.And, of course, by saying the people who committed these horrific acts were Islamic extremists it OBVIOUSLY doesn't condemn all Muslims. If at this point you can't understand that distinction, perhaps there's a cat video out there better suited for you than what we're doing here. I mentioned a couple weeks ago how I'd like to move a bit away from talking about the regressive left. While I still want to do that, I feel like the regressives are like the mafia...the more I try to get out, the more they pull me back in. Case in point: the response by many of the regressives immediately after the attacks was to blame US foreign policy, rationalizing we ourselves are to blame for the people who chose to murder over 100 innocent people. After talking to my last two guests, Douglas Murray and Faisal Saaed Al-Mutar I've come to believe this is a dangerous and egotistically driven view of the world.To the regressives, everything revolves around us -- people only do things as a reaction to us. 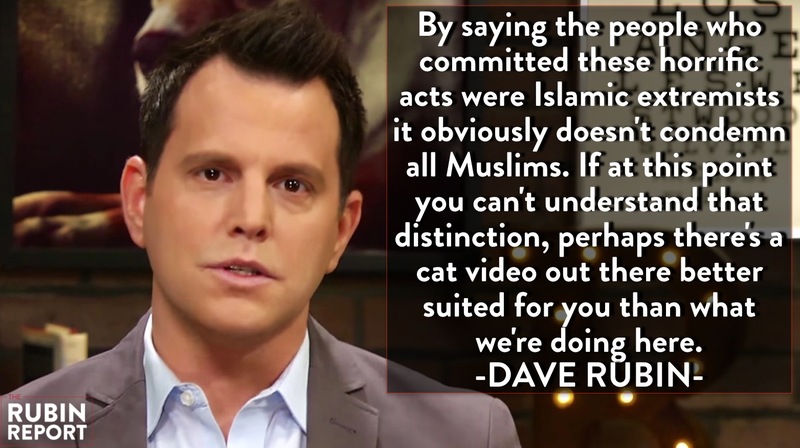 So even though these terrrorists say they're doing it in the name of religion, and point to the actual texts that prove it, well, according to the regressives they just don't know WHAT they're talking about. That said, as Maajid mentioned and as I've been saying repeatedly, two things can be true at once. It can be true that there is an ideology out there: a book written by men a long time ago that gives plenty of reasons to kill all infidels. And at the same time it can be true our western foreign policy created massive instability in their part of the world and perhaps if we left Sadaam in power, ISIS never would would've never arose.Every action leads to consequences, often unintended ones. Sometimes America does good things, sometimes it does bad, but thinking it's all about us -- all of the time-- seems more like how a child would think than how an adult should approach the problem. Of course none of this will stop the regressives from laying blame solely on America and it's allies, thus emboldening both the extremists themselves and those on the far right. I've been trying to have discussions on this show so people can see there are others out there who understand the nuance and complexity of these issues. We don't have all the answers, but we aren't afraid to have conversations that most people won't touch. Let's pretend for a second that all of the worlds issues were 100% because of America and we did exactly whatever it is ISIS wants us to do. Would that make us safer? Actually, it would do the exact opposite by holding the western world in a perpetual hostage crisis with people who have an old text to justify exactly that. Final thought on this: I'm really not trying to score cheap political points here by constantly calling out the regressives. I'm trying to lay out a case to show you that the left is in danger because of the regressive's misguided, head in the sand, politically correct brand of demagoguery. At the end of the day, I blame these attacks on nobody other than the sick, twisted people who committed these horrendous acts of violence. At the same time, I won't stop speaking up against the misguided ideas that will only bring about more of these acts because we are afraid to look at the whole picture and not just our narrow, myopic view of the world.